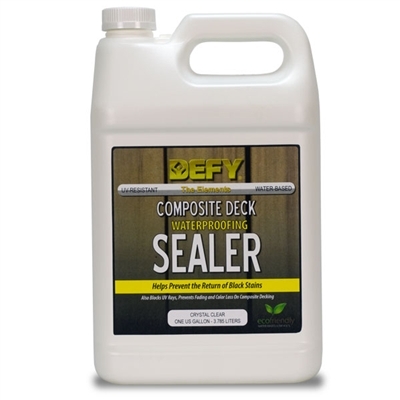 DEFY Composite Deck Waterproofing Sealer contains zinc nano-particles that reflect the damaging Ultraviolet Rays from the sun. When you reduce the size of these zinc particles down to the nano level, they become invisible to the naked eye. These nano-particles are distributed at a rate of over 30 trillion per square inch of surface area to provide protection from the sun in much the same way as they do when used in sun blockers and sunscreen lotions. Not only will this help with prolonging the graying, but the nano-particles are highly resistant to mold and mildew, enabling you to retain the natural color. DEFY Composite Deck Waterproofing Sealer is available in a crystal clear finish.